The new BMS-Modbus/RTU gateway COMTRAXX® COM462RTU, an improved successor to the previous protocol converter FTC470XMB, is available now. 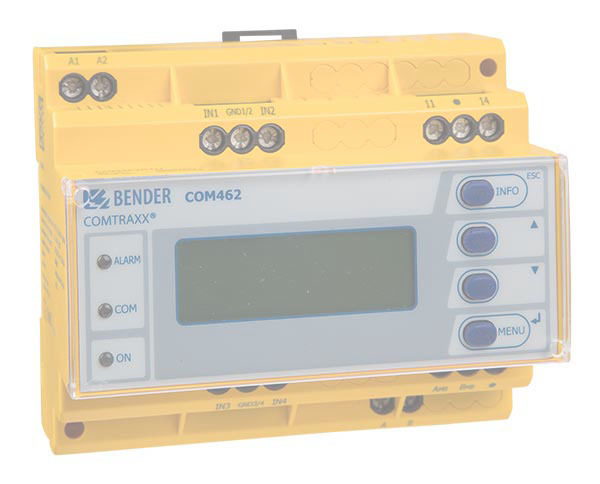 The COM462RTU provides data from Bender measuring devices in a clearly structured manner, using the same process image as COM460IP and CP700. In every case, there is only one device required for each internal BMS bus and nevertheless at a favourable price. That allows easy integration of Bender measured values and messages into higher-level systems. As far as new projects are concerned, we recommend to use COMTRAXX® COM462RTU; for the expansion of existing projects, the FTC470XMB will be available until the end of 2014.